I truly enjoyed my time off this past week. I was able to complete three sewing projects. The first one was posted here. 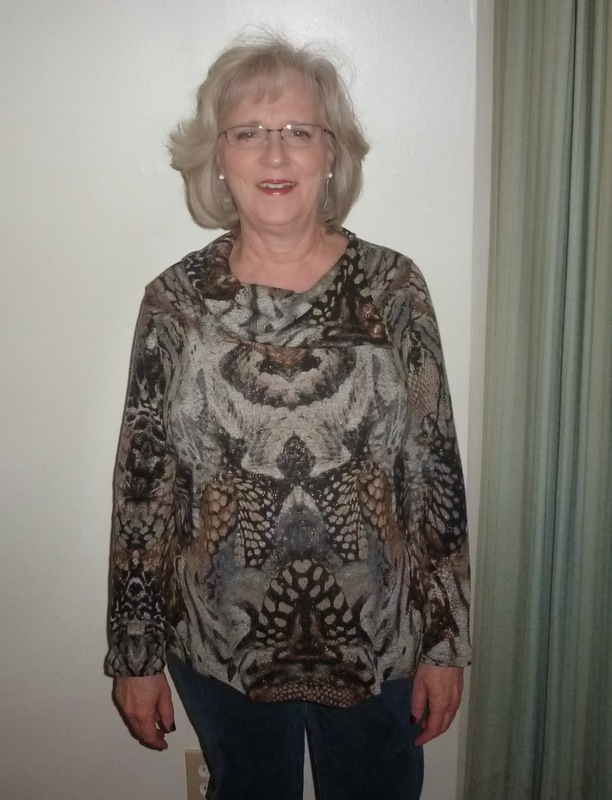 The second project was another McCall's sweater knit top, M6796. My first version of this pattern was a year ago. The second version I deemed a success. There were lots of side seam matching due to the design. 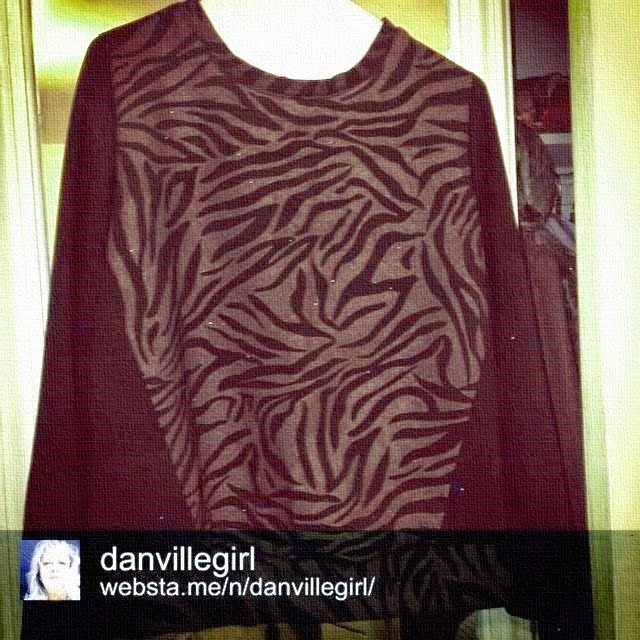 I cut both front and back pieces as a single layer so that I could get stripes and design patterns to match up. Here is the finished top on a hanger. The above side view was a work in progress photo. Wearing photo will come later. I purchased a few new fabrics taking advantage of sales. Of course there are more sales today and I am tempted. Here is a view of recent purchases. 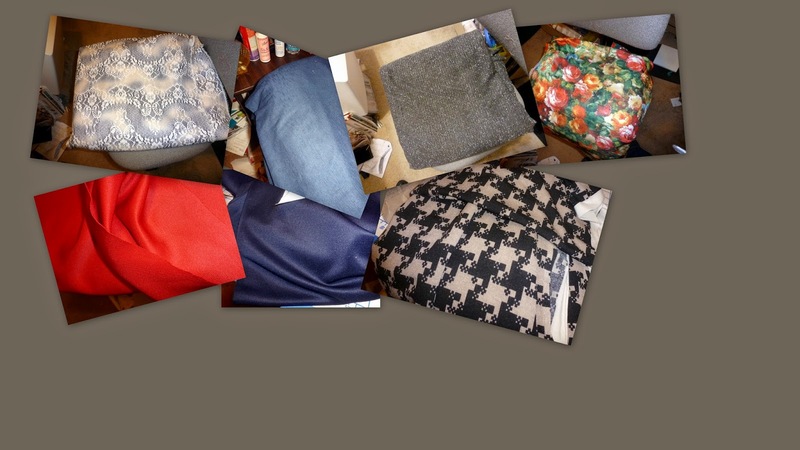 The top four fabrics are most recent purchases from Gorgeous Fabrics. The bottom three are from FabricMart. The large hounds-tooth black and cream fabric is a nice sweater knit that will not stay in the stash long. I have already begun the pattern adjustments to this pattern. Fabric has been washed and dried, and is now ready to be cut. 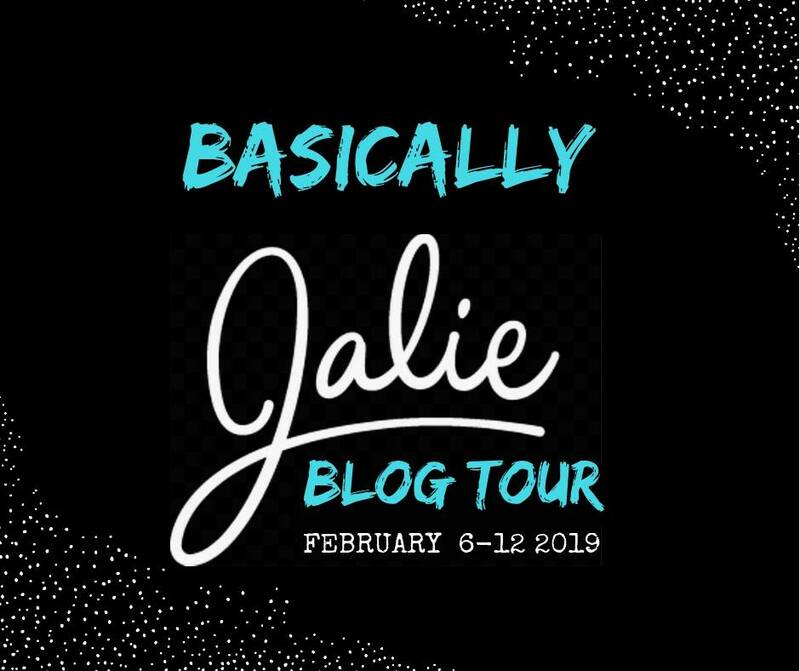 More updates later. I have been able to sew for a couple of days now during my staycation. I gave you a glimpse of Vogue 9026 recently and now I have some additional photos showing more detail. I really like this pattern and do plan to sew more of it. I had to make several fitting changes as I normally do which included a FBA, a FSA, sway back adjustment and a back length adjustment. More detailed review to follow later. I am truly pleased with the fit and look of this. I know that I will make another one from this pattern and will probably try the one with the cowl neck also. I have so many top patterns that I want to sew. I am on a top kick on this time as I really need to replace several that have been worn a lot! I am making view B using fabric left over from my "Reunion" Dress. It is rather thick ponte knit and thus should be fairly warm for our current cold, cold weather. I prepared the sweater knit fabric from EOS readying it for me to cut out on Sunday along with the fabric for the above top. I awoke Sunday morning not feeling well and ended up with a stomach virus that left me feeling "blah" and had no energy for sewing. Taking a few moments here and there on Monday and Tuesday, I have finished cutting out the V9026 and have the sweater knit and McCall pattern on cutting table to find bits of time to do that this week. The intent is to have them ready for the coming weekend. 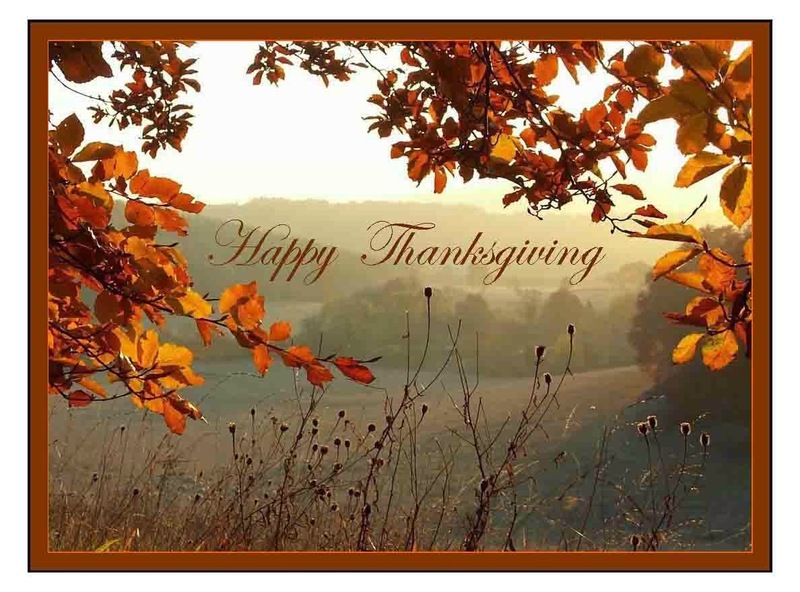 I am taking next week off for a "staycation" and plan to sew along with cooking for the upcoming Thanksgiving holiday. Can you believe it is now that time of year??????!!!!!!! Before I could cut out the McCall's pattern mentioned in my previous post, I needed to prepare the fabric for cutting and sewing. 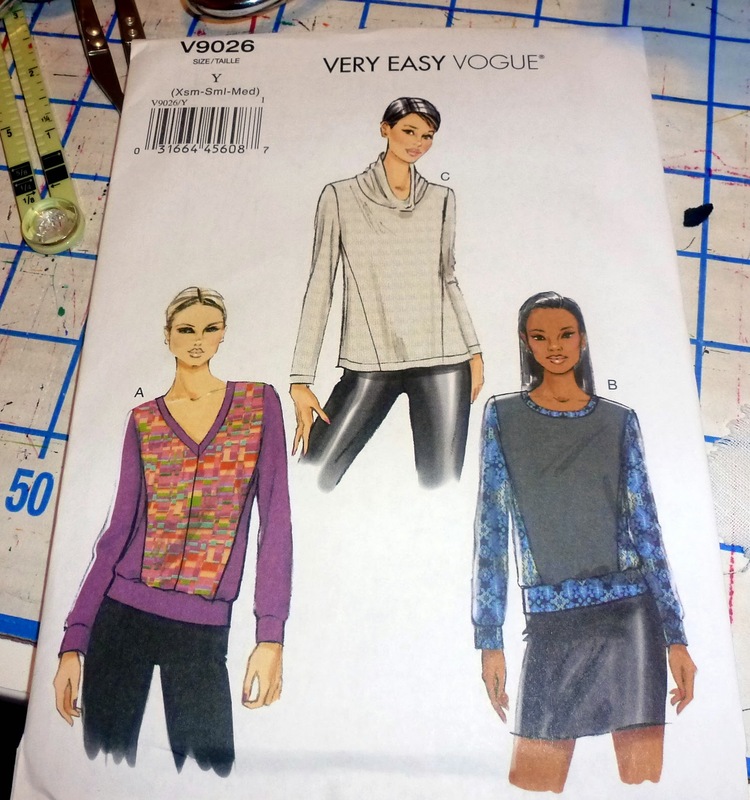 I decided to pull out another top pattern that I have been wanting to make.The pattern is Vogue 9026. Nakisha, "The Sew Crafty Chemist",recently made this top. 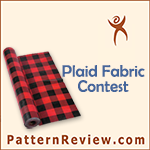 There was a another review of this pattern on Pattern Review. I have seen similar sweatshirts on various websites such as Ann Taylor, The Loft, Dillards and more. I decided I wanted to use fabrics left over from a recent dress I made. This too is fabric from EOS. I have made most all of the normal fitting adjustments I have to make and have pin fitted the pattern prior to this. I still need to make a 1 inch FBA. It is so cold here in southern Virginia today that my usual Saturday morning exercise at the YMCA did not happen, meaning I was not prepared to go out into the cold 20° temperatures. The best use of my morning was to be in my sewing room. I have finally decided what I was going to sew next; the recent drastic drop in temperatures was the motivator for my next top. 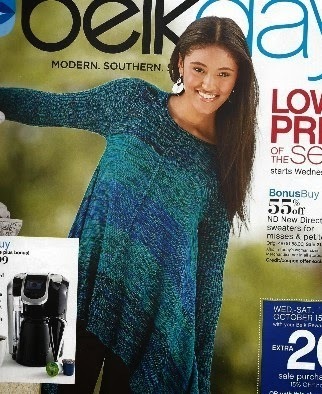 I made McCall's 6796 last year from a sweater knit fabric from EOS. I decided to make this again as I really like the fit of it and since the fit is still good (I wore this top yesterday) this should be a quick project. The fabric will be another sweater knit from EOS that I actually purchased before this fabric. I purchased this in November 2013 so it has aged well. More updates later. I am referring to McCall's 7020. As I noted in an earlier post this pattern has a lot of ease. As a result of reviewing the ease measurements on the back of the pattern, I decided to go with the small size. I ended up using the extra small through the shoulders and the armscye. 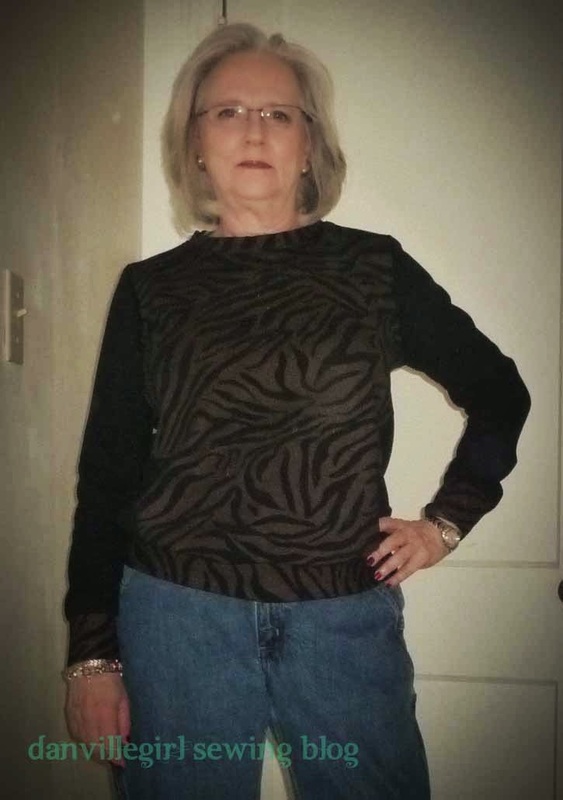 I then decided to transition to medium from the bust down and then decided that the small size would be sufficient. Working on the McCall's top, pattern cut out last nightI did some sewing this afternoon and think that this will be an easy peasy top to sew. It only has three pattern pieces.Went window shopping today and found a few items I liked that I know I can sew.I want some new fabrics. I need some sweater knits to make some cardis.I want to make a few more knit tops to add to my wardrobe for casual as well as work tops.I am also designing some skirts in my head and plan to sew some soon.I pulled out some fabrics from collection to use for these skirts I am sewing in my head.Will share photos of the McCall's top tomorrow. I think I will have finished it by the afternoon. M7020 was reviewed on Pattern Review recently. I had not paid much attention to this pattern until reading the review. What also drew me to this pattern was mailer I received from Belk department store which is rather well known store in the south. On the front was a model wearing a striped tunic with a center front seam. Of course the color of the tunic was also appealing to me; this is my inspiration piece. 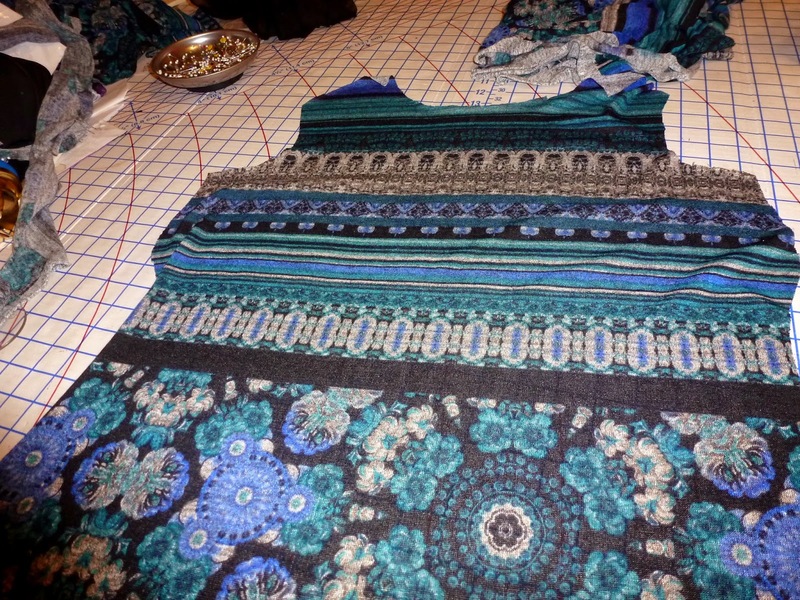 This pattern fits the design as it has a center front seam, with a jewel neckline. 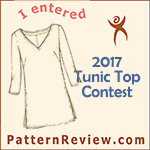 Fortunately the pattern also has several other neckline features such as a drape and a cowl neckline making this even more versatile for additional tops with different neckline. I finally finished the knit top-M6964. It was not a difficult top to sew; I read the instructions before starting the project. 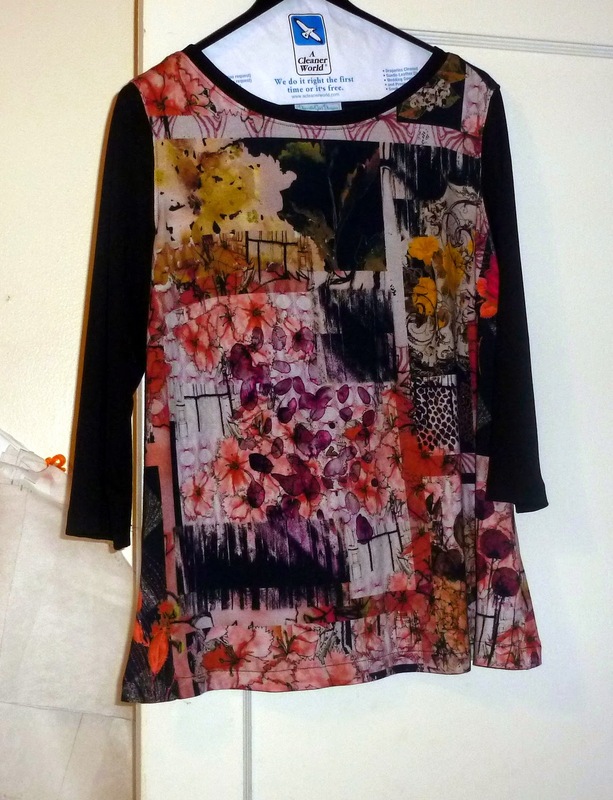 If you have made many simple knit tops then you pretty much sew on autopilot as I did with this top. FBA of 1 inch5/8 inch high upper round back adjustment5/8 forward shoulder adjustmentswayback and shortened the overall back length by one inchreducing the length of the top by one inch and sewing a one inch hem. The fabric used for the bodice was a nice knit from EOS and the black sleeves and neckband are a burnout type knit from I think Fabric.com. It was a little difficult to handle but worked out okay. Here are a few shots of the finished top. I plan to use this pattern again for more simple t's. On to the next top pattern!